At the end of last month I posted this blog post updating you all on my recent decision to go cruelty free with my makeup, and many of you wanted to see a compiled list of brands that don't test on animals - so here it is! 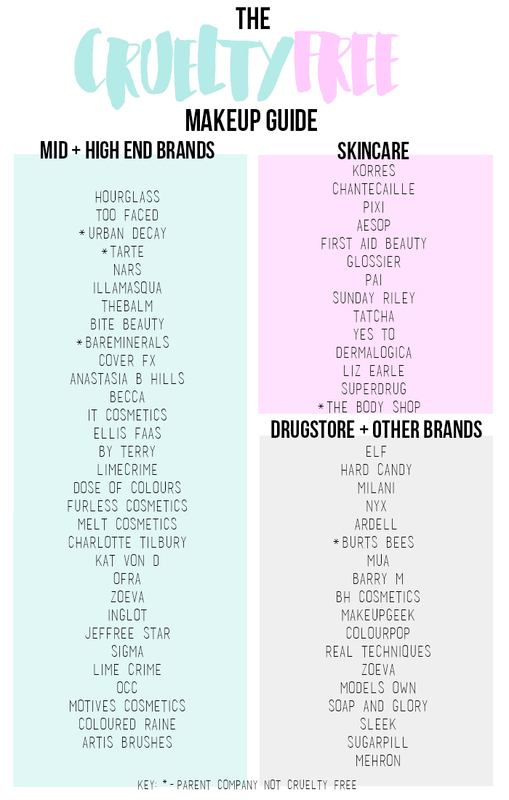 Obviously this doesn't cover every makeup brand as the list would be endless, but I thought I would include brands which I personally love and use, most of them are available in the UK but there are some independent/indie brands that I wanted to throw in there too. It's been quite an easy transition thus far to be honest with you, I'm using up all of the makeup I already own that isn't cruelty free, but I'll no longer be buying any products that test on animals. After doing a fair bit of research, I was pleasantly surprised to see how many brands are actually cruelty free, I was super happy to see some of my favourites up there. I just hope that more brands realise that animal testing really isn't necessary and change their ways ASAP. If anybody wants to see a full list of brands that do test on animals I'd be happy to get my head down and get a saveable image made for y'all. Are any of you cruelty free? How have you found it?